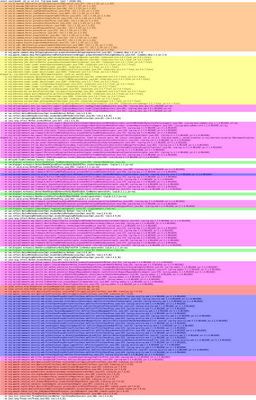 I love stack traces. 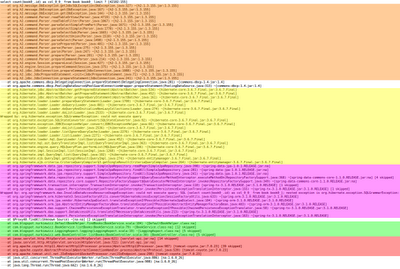 Not because I love errors, but the moment they occur, stack trace is priceless source of information. For instance in web application the stack trace shows you the complete request processing path, from HTTP socket, through filters, servlets, controllers, services, DAOs, etc. - up to the place, where an error occurred. You can read them as a good book, where every event has cause and effect. I even implemented some enhancements in the way Logback prints exceptions, see Logging exceptions root cause first. No longer that pleasant, don't you think? 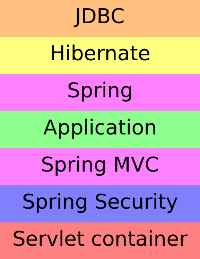 Placing Spring between application and Hibernate in the first diagram was a huge oversimplification. Spring framework is a glue code that wires up and intercepts your business logic with surrounding layers. 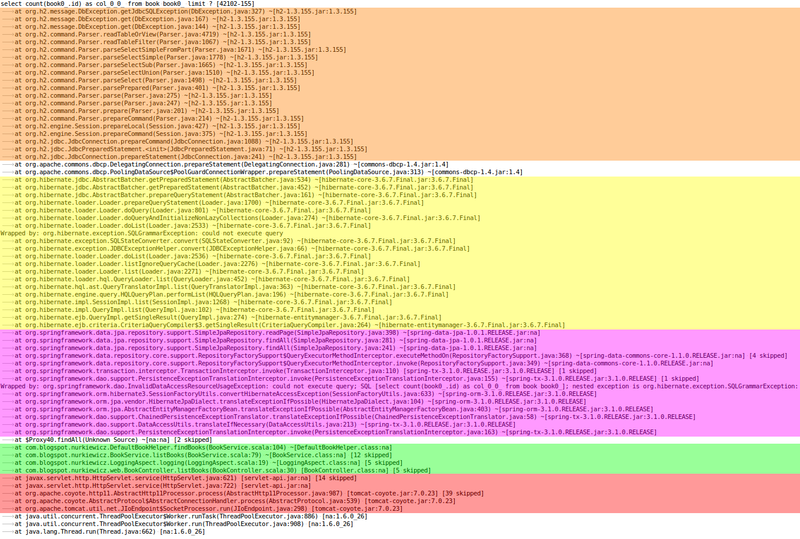 That is why application code is scattered and interleaved by dozens of lines of technical invocations (see green lines). I put as much stuff as I could into the application (Spring AOP, method-level @Secured annotations, custom aspects and interceptors, etc.) to emphasize the problem – but it is not Spring specific. 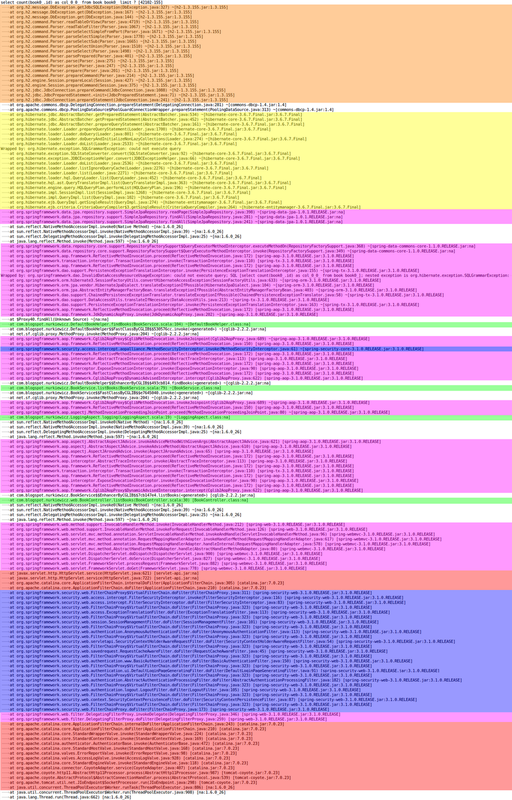 EJB servers generate equally terrible stack traces (...from hell) between EJB calls. Should I care? Think about it, when you innocently call BookService.listBooks() from BookController.listBooks() do you expect to see this? And have you even noticed there is custom aspect in between? That's the thing, there is so much noise in the stack traces nowadays that following the actual business logic is virtually impossible. One of the best troubleshooting tools we have is bloated with irrelevant framework-related stuff we don't need in 99% of the cases. Tools and IDEs are doing a good job of reducing the noise. Eclipse has stack trace filter patterns for Junit, IntelliJ IDEA supports console folding customization. See also: Cleaning noise out of Java stack traces, which inspired me to write this article. So why not having such possibility at the very root – in the logging framework such as Logback? Simpler? If you like this feature, I opened a ticket LBCLASSIC-325: Filtering out selected stack trace frames. Vote and discuss. This is only a proof-of-concept, but if you like to have a look at the implementation (improvements are welcome! ), it is available under my fork of Logback (around 20 lines of code).